Sometimes the way you plan to use your points isn’t the best way to actually redeem them. Sorry. The points game is changing and the best values are shifting on a month by month basis as airfares dip and historically good points values lose their edge. Right now, there’s one value which stands out above almost all the others, allowing you to experience long haul comfort for short haul money, while using fewer Avios points to upgrade to an even more refined experience. That magic trick is buying premium economy with cash, and then either enjoying that – or upgrading using Avios. It wasn’t long ago that £492 would’ve been considered an excellent deal to New York in economy, let alone premium. For under £500, locking in over 7” of extra legroom, recline and space is massive, but why stop there? £492 is a screaming deal in premium worth booking, but you can then upgrade to business for roughly 20,000 points each way, or just one way if you like. Basically, if you have no Avios points this is an awesome deal for a nice and comfy flying experience, but if you do have points you can make it into an even better one. You can only fly on dates where they make seats available for redemption. You earn no points when you actually fly, you just burn them when you book. For NYC, you pay surcharges of £667 per person, in addition to min 100,000 points. If it’s now clicking for you, this Premium Economy deal allows you to book the exact same business class experience for almost £200 less in cash, and 60,000 fewer points. To compare..
£492 + 40,000 points for return upgrade for almost any date, plus earn miles. £667 + 100,000 points for the same seats on limited dates, plus earn no miles. Ready for the amaze-balls kicker? You actually earn Avios and tier points when you take the flights, which means if you spent 20,000 points on a one way upgrade, you’d actually get at least 7,000 back! Ready for the bigger kicker? There’s double Avios when you register and book before April 19th for flights all year. 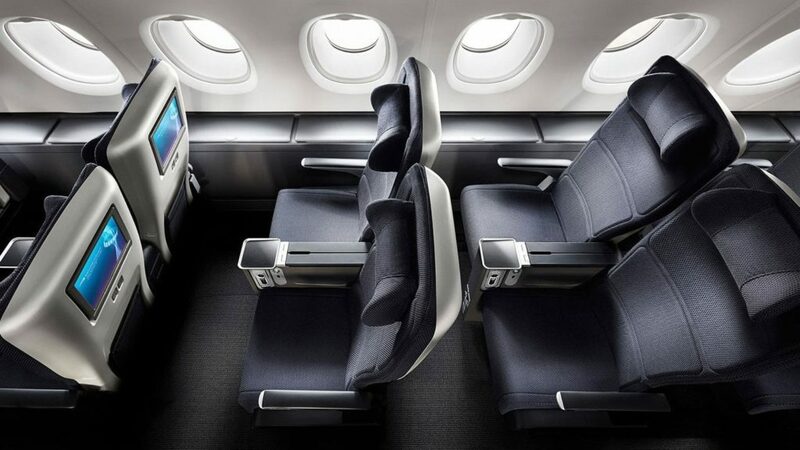 Even better: the upgrade space from premium economy to business class is fabulous on the dates when these cheap Premium Economy flights are available, which means you should have no trouble booking and immediately upgrading. You just need to go about it the correct way, which we detail in depth here. Hint: it’s a must read before you book. £492 Geneva to New York via London Heathrow. £545 Lisbon to Los Angeles via London Heathrow. £549 Dublin to New York via London Heathrow. Read this guide to BA upgrades. Find flights where upgrades to business are available. Book these premium economy deals. Phone up BA and tell them you want to upgrade using Avios. Fly flat for a fraction of the price. Note: if you book via American Airlines you cannot upgrade using Avios Points. If you want to book with BA Avios, you need to book via BA. Great Post! I will be looking for cheap PE fares from now on? One question, do you have to be in a specific fare class to upgrade from PE to Biz? As to your question, for now, no! Any BA PE fare booked direct will work. Can you book on AA metal with a BA flight number and upgrade from PE to biz on the AA flight? Interesting idea. I appreciate that you’re making an effort to generate original content instead of just regurgitating all the same stuff covered by 100 other points/miles blog. How do you search for reward flights that are not direct? Searching Geneva New York returns a this is not a direct flight error message?